Before I get started, here’s my quick breakdown of the previous Insidious movies: Insidious (I dug it a lot and enjoyed the more subtle creepiness), Insidious: Chapter 2 (meh….too much of a rehash of the first one), Insidious: Chapter 3 (surprised me and dug it more than I thought I would). And now we have Insidious: The Last Key……which is part prequel to the original film and also is comprised of flashbacks of an adolescent Elise Rainier as we watch her come to terms with her gift of seeing and communicating with ghosts and the supernatural. Back for this ride is Insidious vet Lin Shaye, reprising her role as psychic Elise Rainier. Also back are her sidekicks (haha) Tucker (Angus Sampson) and Specs (Leigh Whannell). Whannell also pens the script again, which unfortunately turns out to be one of the worst aspects of this sequel. It’s a somewhat tired story of Elise getting a call from a guy who now lives in the old house she grew up in, saying that he needs help to get rid of whatever entity is inhabiting it. We get a pre-story before this in flashback form detailing Elise’s relationship with her younger brother Christian, her tumultuous relationship with her father who won’t accept her gift of seeing the unliving, and also the death of her mother by the hands (or lack there of) of a ghost that Elise unleashed by unlocking a door in the basement. Elise assumes that the same entity that killed her mother, must be the same that is tormenting the new owner of her family home. So she packs up her gear, along with her trusty sidekicks (haha), and heads out to save the day! Yay! While back in her old town, she runs into her estranged brother (Bruce Davison) and his two daughters – one of which she finds out, shares her knack for communicating with pesky spirits. Along the way we get to see a decent main villain called Key Face (ingenious name), who has keys for fingers! It sounds a lot cooler than it actually is. Fast forward to the climax where a battle ensues, a victory party may or may not begin, and everyone in the theater breathes a sigh of relief because the movie is now over. Hitting back to one strong point that I eluded to in the previous paragraph, I actually enjoyed the flashback scenes that showcased a younger Elise. It was refreshing to see how she reacted to her newfound gift and also, how enraged her father became as she refused to deny it. It gave a different dynamic to the Insidious universe that would have worked much better than the majority of what ended up on the big screen here. 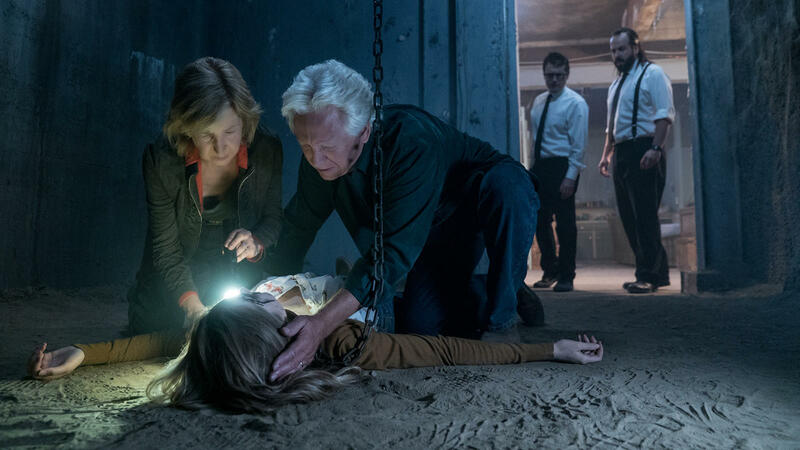 Insidious: The Last Key is yet another horror sequel that does not need to exist. But, it made money. And therein lies the rub. History dictates that there will be more Insidious fun in the future. Money talks. I think I’m tapping out though, unless they can get Patrick Wilson and Rose Byrne back on board. Director Adam Robitel gave us some decent visuals here, but isn’t it a bad sign when I leave a horror movie and quote the comedic lines instead of talking about something actually scary? Meh. So until we meet again in ‘The Further’, happy trails to Elise and her trusty dynamic duo of Tucker and Specs. She’s psychic. They’re sidekick. This entry was posted in Review and tagged Angus Sampson, Angus Sampson insidious last key, best insidious sequel, Bruce Davison, Bruce Davison Insidious Last Key, dirty horror, insidious franchise, insidious last key, insidious last key review, key face insidious, leigh whannell, Leigh Whannell Insidious last key, lin shaye, lin shaye insidious, lin shaye insidious last key, the further insidious by Dirty Horror. Bookmark the permalink.